One of my favorite things to talk about in library land is the genrefication of our library. I frequently get questions about this from folks who have read my blog posts or have seen me present. I blogged about the process all along the way, from the tagging my fiction books, to genre shelving fiction, to ditching Dewey in nonfiction. Those posts were basically my reflections and thoughts from when I made the move. For a while now, I’ve been wanting to write a more comprehensive blog post that I can share as a reference for people interested in genrefying their library. After our AASL presentation, I realized that a series of blog posts would be the way to go. So this post will be the first of several that will detail the process I used to genrefy the fiction and nonfiction sections of our library. The first step in the process is to choose the genre categories that you will use. For fiction, I didn’t want to get too specific with my genres. 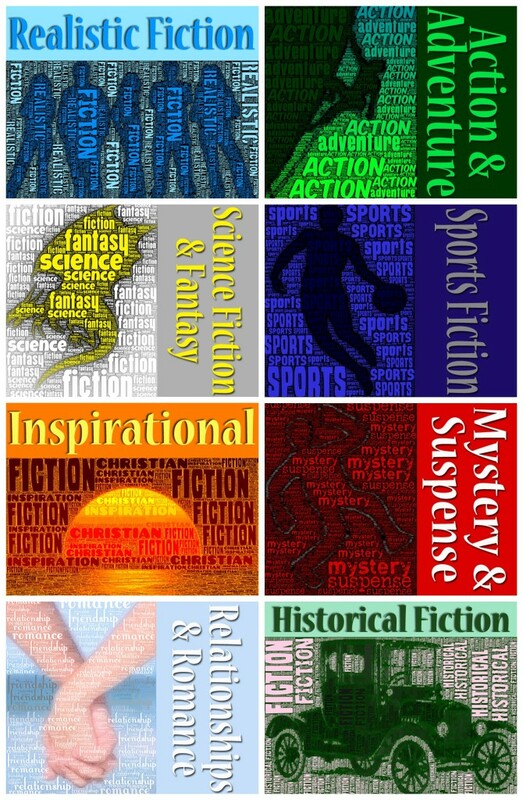 My original categories for fiction were: realistic fiction, sports, romance, Sci-Fi/fantasy, mystery/suspense/horror, and series. As I sorted through the books, I made some changes to these categories so it made more sense for our collection and our students. I decided that it would be better for the series to go with their genres and clearly label them as series within their corresponding sections. I also added several more sections. 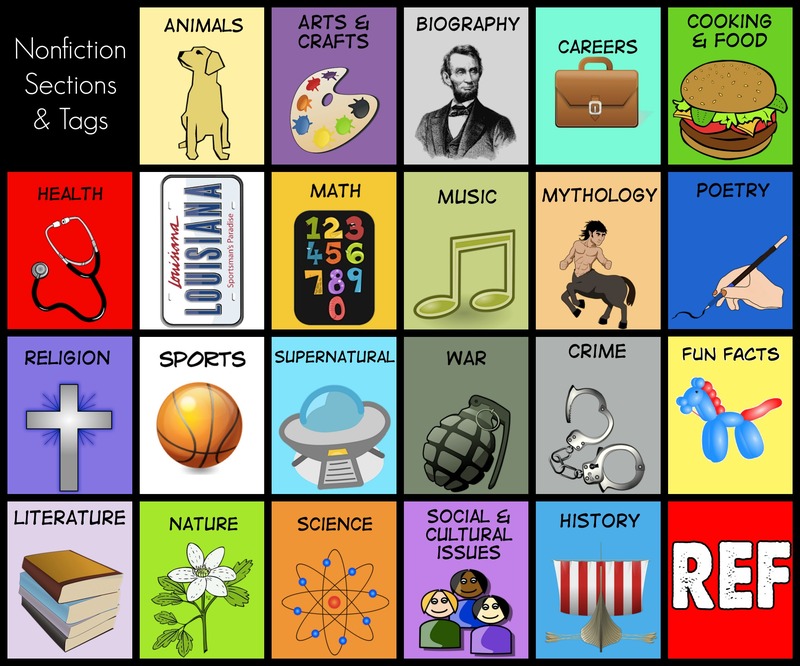 Our fiction genres now include: historical fiction, general/realistic fiction, Sci-Fi/fantasy, action/adventure, mystery/suspense, sports fiction, relationships/romance, and inspirational fiction. Something that I love about this arrangement is that nothing is set in stone and you’re free to make changes to work best for your students and your curriculum — it’s okay to make some changes your categories and subcategories as you go. Make your plan for your categories, but don’t be afraid to tweak it as you go! Ditching Dewey is one of my favorite librarian topics too! Your presentation at AASL13 was great. Before going to Hartford, it felt a bit like there were only a handful of us out there. But after the UNCON and the two sessions on leaving Dewey, I feel like there are a lot of librarians out there that are open to change. One of the best things I got from the presentation was the idea to create my own stickers for NF. I got as many as I could from DEMCO and a few other places, but there were several subjects that I couldn’t find stickers for: U.S. Government, Insects, Farming, etc. Looking forward to the rest of your posts about genrefication! Thanks, Tiffany! This is really helpful. I’m most interested in reorganizing NF and it’s helpful to see different schemes for dividing it. Where do you put state books other than the LA booiks? Interesting concept – but I wonder if it isn’t a bit too colloquial to be ultimately useful. Before Dewey, librarians devised their own systems and this seems a bit like a throwback to those days. I think it’s great to have your own system of color coding that your students will probably learn during their time at your school. But what happens when your students venture out to other libraries with other genre categories and color / sticker combinations? Consistency in cataloging across libraries (be it Dewey or LCC) is what enables us and our students to function independently in any library setting. In terms of long-term sustainability, will one librarian’s genre choices sync with her / his successor? I feel my job as a secondary school librarian is to prepare my students to function successfully in a larger community. I like to think that my students will be prepared to go into any library, access the OPAC and ultimately find the resource they’re looking for. I think it’s great to color code your collection, it’s something I did in my ten years as a K – 9 librarian at my previous school. My students knew that a yellow sticker covering the FIC label meant the book was an easy reader, but they also knew the kitten books they loved were in the 600’s at 636.8. I don’t think you need to choose genre categories over Dewey numbers as many libraries use a combination of stickers and spine labels. Ultimately though, aren’t genre categories really Dewey classifications without the numbers? Wishing you the best of luck with your collection, whichever system you choose. Isn’t it no different than different grocery store chains? Everyone’s system is a little different. (It’s a good thing grocery stores don’t alphabetize) – Just another way to look at it. That’s a great comparison! It’s all about grouping things in a way that makes sense and makes them more accessible to your community. I think a useful library makes a GREAT library and I think this organization makes the library more user friendly for kids! I started thinking about switching my JR High library just a few days ago and started researching it. I am ready to start! I would love to use your materials…I cannot figure out how to get them off of flickr. Is the another way you would be willing to share them? Thank you so much for the information you have put out there,,,your enthusiasm is contagious! I look forward to reading about your genrefying work and seeing how you went about the process differently. We must be on the same wavelength because I, too, found that the detail in the process was what I missed most when researching how to genrefy your library. In order to help others in my district and keep my record, I started posting about my process a couple weeks ago. Thanks so much for you resources and posts, which along with others, inspired me in my genrefying changes when I adopted the library at my high school. Students are responding enthusiastically to the changes; I’m finding that I also got to know my newly adopted collection through the process. I have been so inspired by you and others who are making this move! We are 5 months in and are just about done with our fiction section! I have a 10 hour aide and all she has time to do is shelve books, so I was looking for something to help make it easier for my students to find books on their own. I have taken it a little further and have taken all of our sports books..fiction and non-fiction and put them into one place, with very specific shelf signage. My boys who were only reading non-fiction are now excited about reading fiction! I even put the sports biographies in this section and they are now getting checked out as well! Thanks for the great information!! It’s been a great source of reference for us! So glad you’ve been finding these posts helpful! Having the sports fiction and nonfiction on the same row is a HUGE benefit for me, as well! Good luck as you continue to work through the transition! Although we have genre-organised fiction (adventure/action, animals, comedy, drama, fantasy, historical, mystery and crime, romance, science fiction, short stories, and sports), I agree with Nancy about preparing students for standardised use of libraries beyond school, and our non-fiction is still Dewey, at least in high school. It’s a tough call either way and makes you get to know your collection very well! well I’m finished…almost. All the labels are on and Destiny catalog is updated. Last step is signage. I was going to use my Cricut to make some genre signs but yours are so much cooler!!!! Especially appealing to middle school. Do you have your signs available to share? Or for purchase? Hope you are LOVING the new arrangement! After lots of research and discussion, we decided that this was the best route for us as well! Fiction is almost complete, with a few tweaks here and there needed. We had our 5th & 6th Grade student library helpers sort books and label. When we had books that could have fit into several different genres, we had the students vote on which genre they thought it belonged in. Our easy section is now in the process of being moved and labeled. We started with Favorite Characters, Holiday and Seasonal Books and Favorite Authors. The remaining fiction in this section will eventually be moved into neighborhoods. I’m finding that the students are able to find books a lot quicker on their own! I only have an aide 10 hours a week, so believe me, this is helpful! We’re working on Non Fiction this year. It’s quite a process, but I’ve touched every book in this library, weeded out the old and unused and am enjoying seeing the results! It’s a lot of work, but so worth it! Thanks for all of your suggestions! It’s been a life saver! Thank you for these posts! I have been inspired. I am opening a homeschool resource library at our church (eeekkk!) and was going to use the Dewey system. As the daughter of an English teacher that seemed the only way. I found your blog when looking for something completely different and decided to genrefy our library too. (I haven’t told my Mom yet.) I am using your labels (thanks so much for offering them!) and want to tweak some of them and make some of my own to better fit for our library. Would you mind sharing what font you used? The stickers were created in Comic Life using the font DigitialStrip. I’m excited that the genre organization is working well for you!! I am horrified about this genrefication of school libraries! We are a LIBRARY NOT a bookstore! What is wrong with teaching children how to use the Dewey Decimal System? I believe this is another way of making our children nonthinkers! I am a Library Clerk in a middle school in Virginia. I cannot see us doing this in our library. We work hard to teache the children how to use the library. You want a book about Cocker Spaniels, head over to the computer, look up Cocker Spaniels on Destiny. Write down the call number, go to the non fiction section and viola! There you are, standing in the 636’s. You have found your book. The day my library goes to a genre way of classifying books is the day I quit being a librarian! I can see how this would increase student reading though I’m not running towards it. I would say, if you have heavy circulation there’s no need to change. If your circulation is low, this may help. Choose one genre your students constantly ask for and start there. What did you use to make your signage for mystery/sci-fi/historical fiction etc.? I’d like to make one for my early readers. I’m looking at the genrefication of my Dewey section. I have no problem with Dewey, but I have PS-3rd graders. Using the card catalog is above most of my kids ability, and I can’t be 10 places at once to help them use Destiny while I’m also helping to search for books, checking out books, monitoring for behavior problems, etc. I feel like dividing up the books by genre, using picture labels, etc, will eliminate many of the problems the children have finding non-fiction that interests them. I had the same issue with my K-2 kids after losing my aide. After attending a workshop on genrefication, I turned my picture book section around to a more user-friendly area for the littlest patrons. I decided what categories I wanted ( I have 34 neighborhoods), sorted and put labels (I bought most pre-printed and some I made myself) on them and then added the category to the OPAC record so I could find them quickly. I keep them alphabetized within the neighborhood, even the nonfiction ones (the kids know books with numbers on the spine are nonfiction). It took me about 2 weeks to sort and label them and another week to add to the record. The decision of where to place the book is not hard and fast, I’ve changed several as I discover they fit better somewhere else, and sometimes they will be good in multiple places. You just have to decide what you think makes the most sense. As long as you have a way to locate them, it doesn’t really matter. My students feel so empowered when they can find a book on a topic they want. If they want a specific book, they know they can ask me where to find it and I will have the time to help them. I’ve never regretted spending the time doing it. Hello, my name is Shana and I am a high school librarian. I am currently in the process of changing my classification in my library to be more genera oriented. 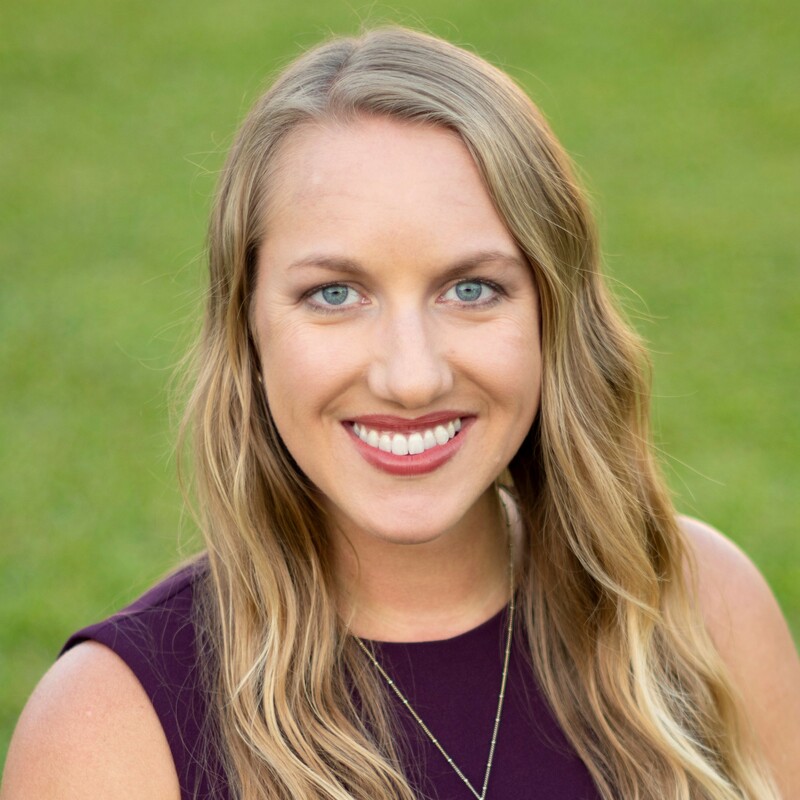 I am also a graduate student working on my MLIS and I am conducting a study on circulation statistics with the Dewey Decimal Classification verse genera classification. I am hoping you are willing to share your statistics with me. Please email me at shana.celentano@gulfportschools.org. I am in the process of genrefying the Young Adult fiction section. We have over 122 classics and I am wondering what your opinion is on having a classics genre section. Or should I separate them into the other categories i.e. Fantasy, Sci Fi, etc.? In my new library (6-12) I have a section called “Literary Classics.” I think it’s nice to have those books all together in their own section, even though they may also fit into other genres. Thanks for all your info. I’m starting to switch over the fiction books now, but I have a question about the ‘classics’. Did you make a section for classics or did you group them in with other genres? For some of them I’m finding it hard to determine a genre or they could fit in multiple. At my old school (middle school) I had classics mixed in the other genres. At my new school (6-12) I have a section specific to Literary Classics. It really depends on your collection and your students. Where did you put nonfiction books about pirates? Looking to get some genre poster made for my High School Media Center. I love the artwork used for these genre signs. I would love to get these exact ones. Can anyone tell where these are from? Hi! I know this is an older post but I am in the process of researching a lot to genre-fy my nonfiction in my elementary library. I notice that you also have subcategories which is something that I am doing to. What do you do with those though? Are the sub categories also added onto the spine label? I didn’t put the subcategories on the spine label. Instead, I printed plain Avery labels with the main category and subcategory to put inside the cover of the book for shelving purposes.